Lake Lugano is nestled between Lake Maggiore and Lake Como and lies partly in Switzerland and partly in Italy. It's surrounded by numerous villages, rolling routesand mountains offering splendid viewpoints and a true round cycling holiday destination. Cycle routes if you are a keen rider: Monte Arbostora, Malcantone, Marzio, Monte Generoso and Monte Sighignola. The lake is footprint straddles the Swiss-Italian border with 67% of its surface area falling within the Canton of Ticino, Switzerland, and 33% of it in the Lombardy Region of Northern Italy. The Melide causeway separates the Northern (27.5 square km, 10.6 square mi) and Southern (21.4 square km, 8.3 square mi) basins, although a bridge in the causeway permits water flow and navigation. You can cycle on a cycle path for crossing the Melide causeway. 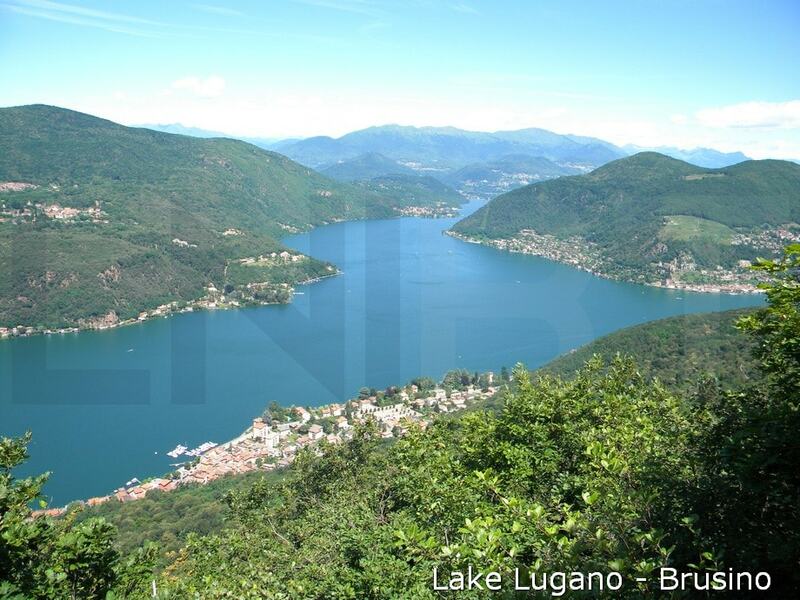 Cycling is one of the best ways to explore the countryside around Lake Lugano . You can cycle the route along the shores of lake. The Southern basin is a 50 km loop (31 mi) completly flat, part in Italy and part in Switzerland . You can ride through Porto Ceresio, Brusimpiano, Lavena Ponte Tresa. For a short time you can then leave the lake and cut across Caslano on back roads. You can carry on your route through Agno, Morcote, Melide, Bissone, Capolago, Riva San Vitale and Brusino. On the the shores of Lake Lugano lies Morcote at the foot Monte Arbostora: one of the most beautiful village of Switzerland. With its characteristic small alleys, the arcades of old patrician homes, valuable architectural monuments and its natural beauty, Morcote is considered the pearl of the lake. Of particular architectural interest, is the church of Santa Maria del Sasso, the terraced cemetery and the Tower of the Captain. If you are a keen rider you can climb up Monte Arbostora: a scenic route for arriving to Carona. You can explore the area gently rolling and densely grown hilly of Malcantone (West of the lake), you can tackle Marzio climb via Ardena (West of the lake), Monte Generoso climb (East of the lake) or Monte Sighignola climb via Arogno (East of the lake). The route that takes you to the top of the Sighignola (1,300 mt. a.s.l) is challenging, but the top rewards you with a breathtaking view. On a clear day, you can see as far as Monte Rosa right through to the Swiss Alps whilst the lake of Lugano lies at the bottom like a pool of polished silver. But to enjoy the view from the top of Monte Sighignola which was not called the balcony of Italy without reason, you have to get there. It's a glacial lake (270 mt - 885 ft a.s.l.). It's 48.7 square km (18.8 square mi) in size, has an average width of roughly 1 km (0.62 mi), a maximum depth of 288 m (945 ft). 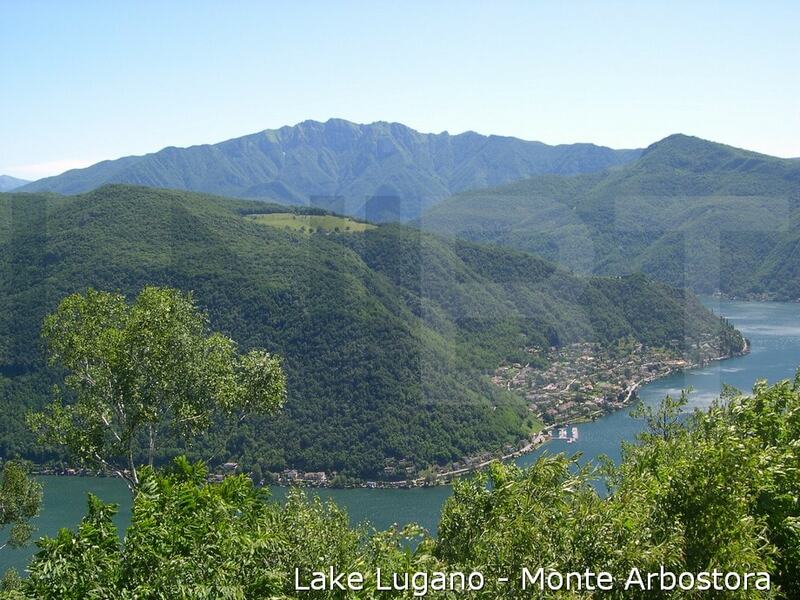 The lake has a number of different branches and is surrounded by mountains: Monte Generoso (1,700 mt – 5,577 ft a.s.l.) and Monte Lema (1,600 mt - 5,249 ft a.s.l.) are the highest mountains. Although the smallest of the three lakes, Lake Lugano lacks for nothing in beauty, character or charm and its Mediterranean type climate ensures it remains popular all year. Thanks to the mild Mediterranean climate, there are even citrus fruit trees growing here, and visitors can sunbathe under palm trees. Lake Lugano is unique in the sense that when viewed from above its shape takes on the form of a river that twists and turns its way through the Ticino(French - Tessin) landscape. This is emphasised by the fact that even at its widest point the lake only manages to span a maximum distance of around 3 km (1.9 mi) from shore to shore. But these characteristics and the myriad of picturesque Venetian-style villages found clinging to its rugged shoreline are some of the very things that make Lake Lugano the popular tourist destination that it is today. The steep wooded mountainsides that form much of its vertiginous shore give a wild, untouched appearance to all but a few valleys where rivers flow in from the mountains. The mountains not only give Lake Lugano a stunning backdrop from nearly every angle, but they provide some of Europe's finest viewpoints to admire it from. The original village settlement lies on the shores of the lake and is off the main traffic artery. Characteristic are the narrow internal streets and its vast square on the lake. The area around Caslano is disseminated with panoramic paths between lake and mountains and the village is full of charming churches and ancient buildings. Its pleasant position among woods and vineyards make Vico Morcote a small architectural jewel and a tourist attraction.The old town centre of Vico Morcote is very well preserved, with narrow streets and porticoes, houses dating to the 17th and 18th centuries and a magnificent baroque church in a panoramic position. On the top of the Mount Arbostora there is a castle dating back to 1450; it is in a dominant position jutting out over the lake, 200 m. above the village of Morcote, all this creating the most suggestive of scenarios. A historical vineyard that is accessible to the public grows on the terraces surrounding the castle. The village of Carona has antique roots and is very picturesque as many architects, sculptors, painters and artists have left behind their masterpieces around town. Carona is located between the summit of Mount San Salvatore (close to Lugano) and Mount Arbostora. In the well preserved town centre that is characterised by its narrow streets and small squares, besides the brilliantly decorated residences. You can visit Swissminiatur at Melide, the well-known park of 1 : 25 scale miniatures, permits you to get an idea of the most characteristic and suggestive places in Switzerland in little more than an hour. There is one interesting aspect to the Campione d'Italia story and that is the fact that thevillage is geographically located in the Swiss Canton of Ticino, however is completely surrounded on all sides by Switzerland. Campione d'Italia is mainly known for its Casino. A five-arched bridge over the River Tresa is also the border between Switzerland and Italy so there are actually two villages called Ponte Tresa. It's one of the few places in the world were visitors can stand with one foot in Italy and the other in Switzerland. This pretty little village on the Italian side of the lake is home to a lively harbour from where boats cross the lake to Switzerland. There are also great views across the lake to the village of Morcote, to the other shore of the lake, and the town itself, whilst not boasting any tourist attractions of note, has it's own charm. The scenic road that winds its way from the village to Marzio and to Ardena makes a spectacular look out point. It provides beautiful views of the mountains around and the lake.